There are a variety of ways to provide users with a method to start the photo booth sequence and to change the settings. These include the standard PC keyboard or mouse, a touch screen, StealthSwitch, StealthSwitch II or StealthSwitch 3, external arcade style buttons, a wireless presenter or a coin acceptor. The user is able to start the photo booth sequence and can also be allowed to select between black and white and color photos, to select the number of copies to be printed or to switch between different profiles. This article describes each of the input options in more detail. Using a keyboard has the advantage is that it doesn't require any special setup and allows the users to select different options e.g. F4 to start the photo booth sequence, Ctrl+B to select black and white, Ctrl+K to select color, numpad '+' to increase the number of prints and numpad '-' to decrease the number of prints. The main disadvantages of using a keyboard are that it doesn't look very professional and there is no way to prevent users from selecting some options (such setting the number of prints to 9) or from pressing the Esc key to exit fullscreen photo booth mode. This is probably OK for a small family event but isn't really suitable for a larger event. Touchscreens either come built in to a PC as standard (such as with a tablet PC or all-in-one PC like the HP Touchsmart series or the Asus Eee Top) or as a special touchscreen monitor which can be plugged in to any PC via the video port and a USB port. It doesn't really matter which option you use as they work in the same way. Touchscreen operation is similar to using a mouse: when the user touches the screen this has the same effect as moving the mouse pointer to that point on the screen and pressing the left button. 4) "Left click top left to start, right click to toggle B&W mode". Clicking the left mouse button will start the photobooth shooting sequence. Right clicking the mouse toggles between B&W and color modes. The sensitive screen area for the top left is anywhere in the top 2/5th and left 2/5th of the screen. The bottom left area is anywhere in the bottom 2/5th and left 2/5th of the screen. The Asus Eee Top PC: an all-in-one PC with touchscreen. This is quite a stylish all-in-one solution which just needs a camera and printer to be connected for a simple photobooth. The Intel Atom processor isn't as fast as a laptop or desktop PC costing a similar amount and this does mean the prints can take a bit longer to be formatted and output. This photo also shows a disadvantage of using a touchscreen which is that they tend to get covered in smears and finger prints (see the left side of the display). A good cleaning cloth and regular cleaning is essential! When using a touchscreen set the start option to "Touchscreen" and then press the "Settings..." button to define up to ten sensitive areas on the screen and the actions they are associated with. The screenshot below shows touchscreen settings which define an area in the top left corner to start the photobooth shooting sequence and areas below to select B&W and color modes. Simple feedback can be provided by designing different screens for B&W and color shooting and for different numbers of prints. This is described in more detail in the previous section. A touchscreen also allows users to enter details such as their email address if the touchscreen keyboard option is used. The keyboard can be displayed at the start or the end of the shooting sequence and is fully configurable. Please see the help files for more information on using this option. The StealthSwitch is a robust foot switch which plugs straight into a USB port and makes an ideal switch for photobooth operation. It is very easy to use: simply plug it in to any spare USB port, wait a few seconds for Windows to recognize it and you're ready to go. In full screen photobooth mode pressing the StealthSwitch button will start the photobooth sequence - that's all there is to it. Note: If you have already installed the "desktop cloaking" software that comes with the StealthSwitch you need to disable it otherwise every time you press the button the photobooth display will be hidden. Note: The StealthSwitch 3 has replaced the StealthSwitch II and is functionally identical but comes packaged in a different way which makes it more suitable for professional photo booth use. You can either source your own arcade buttons, cables and connectors as described below or select from a range of pre-wired cables and arcade style buttons available for purchase from the StealthSwitch 3 website. When you've finished press the Program button to program the StealthSwitch (you only need to do this once - the StealthSwitch will remember the settings and can be used on any computer). The StealthSwitch and any auxiliary buttons are now ready to be used to control the photobooth. If you have problems programming the StealthSwitch please try right clicking on the StealthSwitch Configuration Utility icon on the desktop and selecting the "Run as administrator" option. Some systems also need rebooting after installing the configuration utility before it will work properly. Many arcade style buttons have a bulb to illuminate them and these could be turned on all the time or you could run a script to illuminate the button only when it is active e.g. the "Start" button would only be illuminated when the ready screen is displayed. Please see this article for details on how to use a script to control when the buttons are illuminated. A wireless presenter such as the Kensington Wireless Presenter provides a simple and effective way for the operator to wirelessly control the photobooth. Please note: some wireless presenters don't send F5 when the laser pointer button is pressed. 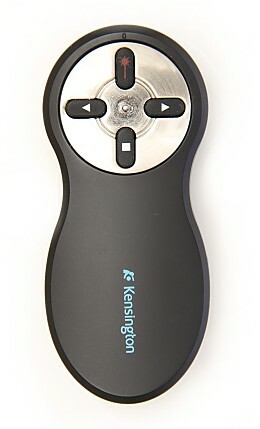 The Kensington wireless presenter (model number: 33373) shown above does send F5 but other similar looking wireless presenters may not. You can also use a coin acceptor like the one below with your photobooth. Please see this article for more information.